(0 Customer Reviews) | Write Review 12 issues per year Everyday Practical Electronics (EPE) is the world's premier hobbyist magazine for electronics and computer enthusiasts, with construction projects for beginners and experts. Every issue is packed with ideas, theory and projects to build, with full circuit diagrams, printed circuit board layouts, artwork and photos. If you're interesting in learning more about electronics and computing, then EPE is bound to have something for you. 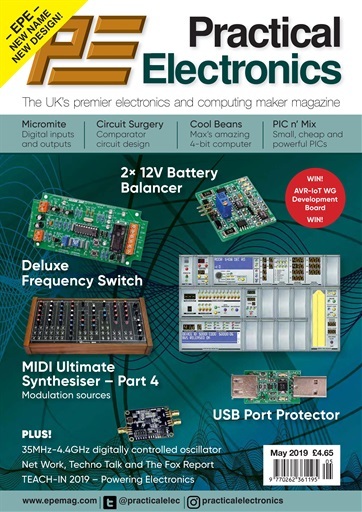 Regular features included in the magazine are: Techno Talk, a review of the latest, often quirky, developments in technology; Circuit Surgery, an in-depth investigation into readers’ circuit queries; Practically Speaking, where Robert Penfold explains the techniques of building electronic projects, including soldering etc; Pic N’ Mix, our feature on PIC microprocessors; Net Work discusses developments, software and equipment for use on the Internet; Raspberry PI, where this special microcomputer and its ancillaries are reviewed and developed; Interface - circuits and components to use with your computer. Practical Electronics May 2019 Issue. 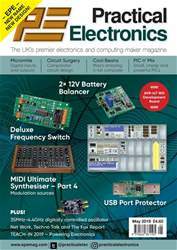 Everyday Practical Electronics (EPE) is the world's premier hobbyist magazine for electronics and computer enthusiasts, with construction projects for beginners and experts. In addition to all this there is news from the world of electronics, special offers, a selection of books and CDROMs to buy. Readout – reader’s letters – plus regular in-dept Teach-In series where newcomers can learn all about digital and analogue electronics, and more knowledgeable readers can brush up on their understanding. You'll receive 12 issues during a 1 year Everyday Practical Electronics magazine subscription. You'll receive 12 issues during a 1 year Everyday Practical Electronics magazine print subscription.